Today is the day that the bones of Richard III will be laid to rest at Leicester Cathedral, so this weeks article is about his reinterment. First of all you can watch the burial on Channel 4 in the UK and highlights later on today. You'll probably be able to watch it, later, on 4oD as well. He was born on the 2 October 1452 in Fotheringhay Castle in Northamptonshire to Richard Plantangenet, Duke of York, and Celcily Neville, Duchess of York. He was never meant to be King but his brother, Edward IV, died on the 9 April 1483, aged 40. 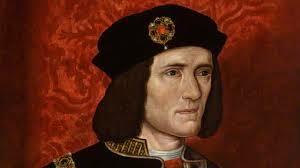 This left his 12 year old son, Edward V to be King. However, Parliament declared Edward V and his brother Richard, Duke of York to be illegitimate as Edward IV had been precontracted to be the husband of Lady Eleanor Butler. With the latter being petitioned by Lords, Knights and Gentlemen to be the only legitimate descendant and be King over Richard, Duke of Gloucester, Parliament declined the petition. On the 6 July 1483, Richard (Duke of Gloucester) was made King, with Edward and Richard (Duke of York) sent to the Tower of London and were rarely seen again, leading to the Princes in the Tower mystery. He was accused of being the murderer of the two princes, although once he was King he didn't need them killed. Two years later, Henry Tudor, the wife of Anne of York, Edward IV's daughter, fought Richard at The Battle of Bosworth Field, where Richard was killed, aged 32. Henry was crowned King, once the act, which made Edward and Richard (Duke of York), was appealed. This is why his claim to the throne is regarded as 'flimsy'. Another point we have to look at is that Henry VII would have needed Edward and Richard killed, to be crowned King. Below, I have made a small tree. Note that there were other issue. What do you think Richard was like, was he child murderer or was he caught up in Tudor propaganda? Comment below.